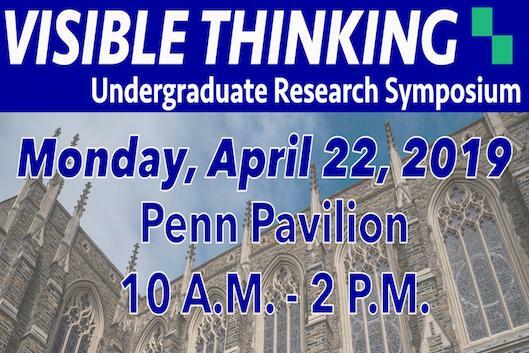 On April 22nd, 2019 from 10-2pm in Penn Pavilion, Duke's annual Visible Thinking Symposium will be occurring. This event celebrates the achievements of undergraduate researchers and explores their original scholarship in the humanities, the natural sciences and engineering, and the social sciences. Visible Thinking is open to all Duke undergraduates. All students who receive support from the URS office are expected to present at Visible Thinking. If you are interested in presenting your research at the Visible Thinking Symposium please go to https://undergraduateresearch.duke.edu/visible-thinking. Students are committed to presenting for 1 hour on their research during the symposium.